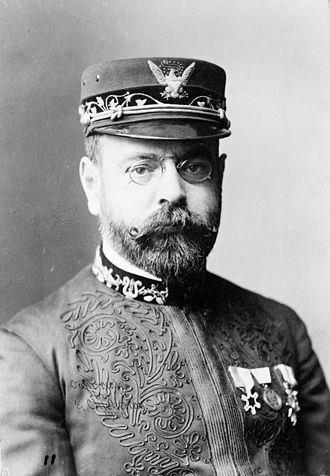 Today is the birthday (1854) of John Philip Sousa, composer and conductor of the late Romantic era, known primarily for U.S. military and patriotic marches. Because of his mastery of march composition, he is known as “The March King” in the U.S. and the “American March King” owing to his counterparts in other nations. Among his best-known marches are “The Liberty Bell”, “The Thunderer”, “The Washington Post”, “Semper Fidelis” (Official March of the United States Marine Corps), and “The Stars and Stripes Forever” (National March of the United States of America). Sousa’s father was of Portuguese ancestry but born in Spain and his mother of Bavarian ancestry. Sousa began his career playing violin and studying music theory and composition under John Esputa and George Felix Benkert. His father enlisted him in the United States Marine Band as an apprentice in 1868. 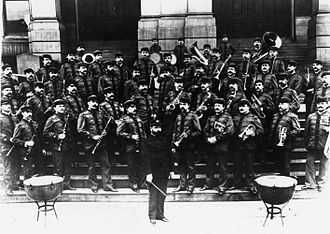 After departing the band in 1875, Sousa learned to conduct. From 1880 until his death, he focused on conducting and the writing of marches and the writing of operettas. He eventually rejoined the Marine Band and served there for 12 years as director. On leaving the Marine Band, Sousa organized his own band. He toured Europe and Australia and help develop the sousaphone, a large brass instrument similar to the tuba. On the outbreak of World War I, Sousa was commissioned as a Lieutenant Commander and led the Naval Reserve Band in Illinois. Following his tenure, he returned to conduct the Sousa Band until his death in 1932. “The Liberty Bell” was written for Sousa’s unfinished operetta “The Devil’s Deputy,” but financing for the show fell through. Shortly afterwards, Sousa and his band manager George Hinton attended the Columbian Exposition in Chicago. As they watched the spectacle “America”, in which a backdrop depicting the Liberty Bell was lowered, Hinton suggested “The Liberty Bell” as the title of Sousa’s recently completed march. Coincidentally, Sousa received a letter from his wife, saying their son had marched in a parade in honor of the Liberty Bell. Sousa agreed. He sold “The Liberty Bell” to the John Church Company for publication, and it was an immediate success. The march is played as part of an exhibit in the Liberty Bell Center. The United States Marine Corps Band has played “The Liberty Bell” march at four of the last six presidential inaugurations: the 1993 inauguration of President Bill Clinton, the 2005 inauguration of President George W. Bush, and the 2009 and 2013 inaugurations of President Barack Obama. “The Liberty Bell” is also the official march past of the Canadian Forces Public Affairs Branch. The march follows the standard form of AABBCDCDC. The trio (section C) typically uses tubular bells to symbolize the Liberty Bell ringing in the distance, but occasionally (as here) other bells are used. The bells usually begin during the first breakstrain, but some bands use them at the first trio. Monty Python’s use of the melody is ironic. Terry Gilliam, the only US Python, decided to use the theme. He has said the piece was chosen because the troupe thought it could not be associated with the program’s content, and that the first bell strike and the subsequent melody gave the impression of getting “straight down to business.” It was also chosen because it was in the public domain and free from royalties, as there was no budget for theme music copyrights. The Monty Python mode of presenting the tune was with a single strike of the bell, lifted from the third section and increased in volume, followed by a strain of each of the first two sections, followed by the famous stomping foot and a noticeably flatulent “splat” sound reminiscent of a whoopee cushion (though the first episodes used a “hiss”). At the end of Monty Python Live at the Hollywood Bowl, the entire march was played over the closing credits. “The Liberty Bell” was used by the Foot Guards before it became associated with the television series, after which they chose another march. Nevertheless, the march remains popular with British military bands. The association with Monty Python is the main reason for its popularity there, other Sousa marches being generally too linked with US patriotism. The classic USMC breakfast is S.O.S. (you probably know what that means) – creamed beef on toast. 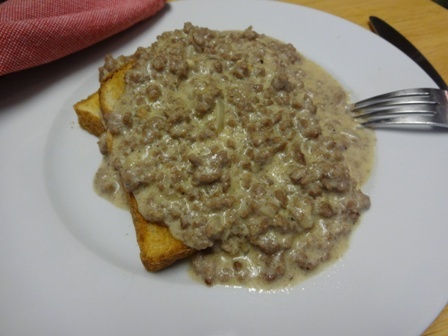 A number of years ago (back in the 70’s), San Francisco’s own Marine Artillery General (Brigadier) Tiago, requested/ordered that a recipe for the Marine Corps’ famous creamed beef on toast be developed so that it could be served to a small group of about eight people. This way the general could have his wife make it at home. The official recipe for the mess halls serves 300 or more. This challenge was taken up by his chief field artillery cook, M/Sgt Bernie Parker. After many tries and a few mistakes “Top” Parker came up with the following recipe. The knowledgeable will note that this is made with ground beef and not chipped beef. Using a large skillet (12″-14″), crumble and brown the ground beef with the fat and salt, remove the pan from the heat and let cool slightly. Mix in the flour until all of the meat is covered, using all of the flour. Replace the skillet on the heat and stir in the milk, keep stirring until the mixture comes to a boil and thickens (boil a minimum of 1 minute).